In our fast-paced modern world, most people hardly have time to sit down while eating a meal, let alone cook one from scratch. Consequently, it has become extremely popular for people to create smoothies. You get throw your desired ingredients in a container and pulverize the material into an edible, soup-like consistency. Fruits and vegetables are most commonly used in these convenient concoctions, though many people also add nuts, seeds, dairy, sweeteners, and even coffee or another stimulant. You get to drink the mixture on-the-go, in between meetings, or solely as a meal replacement if forks and knives are too much of hassle. But, not all smoothies are created equal. The final product is dependent on the quality of the blender being used. In this article, we dissect the 4 best blenders for smoothies on the market, noting their unique qualities, how they differ from each other, and ending with our judgment on which blenders are best for certain demographics. Vitamix is considered the Porsche of the Blender industry. The Professional Series 750, first released 6 years ago, certainly does not disappoint. It costs $514.00 and features a 64-ounce, BPA-free plastic container with a stainless-steel blade that is considered “aircraft quality”. The motor offers a peak power of 2.2 Horsepower, which equates to about 1640 watts of power. This makes it one of the strongest motors on the market according to wattage, though this is not the only determinant of quality in a motor. What truly sets Vitamix apart is the durability of their products. They rarely break or malfunction despite being utilized almost every day by most users. What’s great about this blender is it offers the ability to control the speed of blending throughout the blending process. Specifically, there are 10 different speeds. This allows the user maximum control over the texture and consistency of the final product and makes it also perfect for blending heavier foods like nuts, seeds, and grains. What’s also unique about the Professional Series 750 is that you can remove the top while blending foods in order to modify your creation. This might seem insignificant, but if you are tinkering with an experimental recipe, then you can avoid constantly starting and stopping the machine to add new ingredients. This ability to remove the top is also an indication of the device’s stability and effectiveness. Rarely does any of the blended food splatter or splash upwards out of the container, which also makes for easier cleanup. The Vitamix is notable for being so powerful that you hardly need to prepare the ingredients you are using before putting them in the blender, as the device will pulverize them in a matter of seconds. The only complaint that many people have with the Professional Series 750 is that it is not considered dishwasher-safe. But, the device does feature self-cleaning technology that is even quicker than running the dishwasher. It only requires that you fill up the container with some soap and water before starting the self-cleaning mode. Any complaint concerning the cleaning system of the machine is probably rooted in an attachment to using dishwashers and a stubborn resistance towards trying new technology. Some users also complain that the device is too expensive. But the best blenders for smoothies warrant the higher price tag. On the other hand, a cheaper blender that is less durable might end up costing more in the long run anyway. Blendtec is considered the smartphone of the blender industry. Their products are truly cutting-edge and feature technology that is years ahead of their competitors. The Designer 725 model includes a 3.8 peak horsepower motor. It’s almost twice as powerful as Vitamix’s 750 series. This translates to about 2800 watts of power, which is unparalleled in the industry. This means the 725 will have no problem pulverizing just about any material. Many blenders struggle with thicker substances like flours, ice, and frozen fruit, or take a long time to sufficiently break these substances down. Lower quality blenders will often not even totally break down these harder materials. However, if you buy Blendtec’s 725, you will rarely have to worry about this. The machine will break down any kind of foodstuff almost instantly. This means less waiting time is required for making smoothies. This maximizes their convenience and portability. It might seem insignificant at first, but if you are making a smoothie every day, this saved time could add up over the course of several years. The other unique feature included in the 725 is a touch interface that is seamless and easy to use. While this doesn’t translate to making a better smoothie per se, it does mean that the device has a very futuristic aesthetic – it will dovetail well with any modern interior design. This is especially important if you spend a lot of time in your kitchen, as a hunky, ugly, old-fashioned blender could reflect poorly on the aesthetic of the space. More specifically, the base of the machine features a tiny screen that displays all kinds of information depending on what mode you use. A common problem with many lower-quality blenders is that they randomly malfunction and prevent users from finishing their creation. This is especially frustrating when you are in a rush or are particularly hungry. The 725 mitigates these errors by featuring what Blendtec calls its Smart Blend Technology. It is able to problem-solve any malfunctions and communicate the solution to the user using its screen. Many users also love the dynamic speed options on the 725. The machine offers 100 different speeds to allow users to perfectly sculpt their meal to their liking. One potential con of this machine is that it is quite loud when compared with the Vitamix 750. It could be annoying if used in the morning while other members of the household are sleeping. Additionally, many reviewers on Amazon have commented that they wished the container was made of glass, not plastic, as that would make the process of cleaning up significantly easier. Still, like the Vitamix 750, Blendtec’s 725 contains a self-cleaning feature that should do as good of a job as cleaning by hand. This is a characteristic of many of the best blenders for smoothies on the market as companies are realizing how annoying it is to clean the container manually after every use. The Breville Boss Super Blender is another popular option for people looking to make smoothies and want the best quality blender available. This model features a 68-ounce jug made from BPA-free, Tritan plastic. Tritan is lauded as better than glass in that it is more lightweight and durable. This means that if you drop the container on the Boss Super Blender, that it should not crack, break, or dent at all. This also makes the container dishwasher safe. This might be more convenient for you if you loathe cleaning the device by hand or using the self-cleaning function. The Boss Super Blender features a slightly less powerful motor than the Vitamix 750 or the Blendtec 725. With a 2.2 Peak Horsepower or 1640 watts, this machine includes a ProKinetix blade that is specifically designed to prevent lumps of food substances from escaping pulverization. This means that the resultant smoothie is guaranteed to be smooth and creamy. Like the previous blenders on this list, the Boss Super Blender comes with a number of pre-set modes. 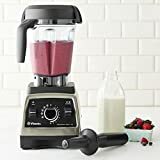 This allows you optimize the smoothie you are creating, whether that is a more traditional fruit smoothie or something more extravagant like a soup or dip. One of the most unique features of this device is the quality of its built-in sensor, which detects whether the device is overheating. If this happens, the sensor initiates a ventilation system to prevent any malfunction from impairing the durability of the device. Many reviewers commented that other blenders on the market typically go into “overload protection” if you put too much food in them. But the built-in sensor on the Boss Super Blender helps prevent this from ever happening. This means that if you are creating smoothies for multiple people, you can put more in the container to avoid having to blend multiple times. 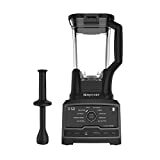 Only about 5% of Amazon customers gave the Boss Super Blender a 1 or 2 star – it’s a very reliable device and more affordable than the 750 from Vitamix or the 725 from Blendtec. As a result, it can be considered one of the best blenders for smoothies on the market. The other notable company in the smoothie blending industry is SharkNinja. They typically offer more affordable options with comparable durability, quality, and power. The Ninja Chef 805 features a 1500-watt motor. Like the three previous blenders discussed, the Ninja Chef 805 also comes with stainless steel blades, speed control variability, and a number of pre-set modes. However, the pre-set modes on the 805 are not as sensitive and often require the user to stop blending and switch the machine into manual mode to finish off the creation. This is a significant difference when compared with Vitamix’s 750 series, Blendtec’s 725 series, and Breville’s Boss Super Blender, as all those devices feature pre-set modes that require little to no attention. You just simply switch them on, walk away, and return to a perfectly blended creation of your choice. With the Vitamix, the device can result in cavitation when blending using a pre-set mode. This means that air pockets are created at the bottom of the container that causes the blades to freely spin without mixing up the foods. This inefficiency can result in overheating or can oxidize and damage certain precious substances like fruits or veggies. While the possible cavitation is not a deal-breaker, it does mean that the user has to be more vigilant when using a pre-set mode and cannot walk away from the device as often. The main benefit of this device over other ones on the market is its cost. Many reviewers on Amazon have commented that the device is incomparable at its price point. Unless you are a sous chef or food connoisseur, you will not notice a difference between the Ninja Chef 805 and other more expensive models from companies like Vitamix, Blendtec, or Breville. Thus, if you are just looking to make some simple smoothies and are on a tight budget, then this device might be best for you. The other unique feature about the 805 is that it features a different kind of lid that locks into place. The Vitamix, Blendtec, and Breville models all feature looser lids that allow for adjustments during blending. While this looser feature makes the device more dynamic, it can also result in messes depending on how much food you are blending and the nature of this food. With the 805, you can help prevent food splatter with the tighter lid, but you also lose some control over the culinary process. The Vitamix 750, the Blendtec 725, and the Breville Super Blender are all more durable and feature a more powerful motor. However, Ninja Chef 805 is still the best bang for your buck, especially if you are just making simple smoothies. If you are interested in slightly more complicated creations, like making fancy dips and spreads, or even doughs for baking, the Blendtec 725 is the best deal. Despite its high price tag, and if you’re going to spend the money anyway, you might as well go with the best of the best. Blendtec’s 725 offers this, with the added benefit of a gorgeous aesthetic.